Fresh Strawberry Sauce ready for strawberry shortcakes! I can't resist all the fresh strawberries, although this recipe works great with blueberries too. 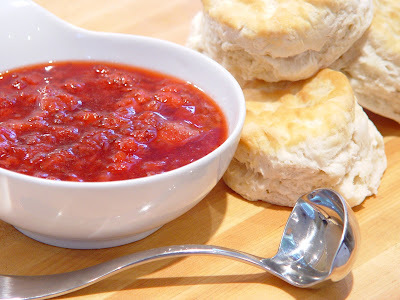 It's real simple, just a few ingredients and you have fresh strawberry sauce. A simple sauce to drizzle over about a million things. One of my favorite things to do is to whip something up out of nothing. Stir all ingredients together in a medium sauce pan and bring to a boil over medium high heat. Reduce heat to medium and cook for another 15 minutes until thickened. Let cool and refrigerate.